Vittorio De Sica is best remembered for his 1947 movie Bicycle Thieves, an overly manipulative and simplistic piece which is one of those films people pretend to like to impress other folk. Screenwriter Cesare Zavattini and De Sica collaborated on a number of films all dealing with similar themes of social injustice. Miracle in Milan is lighter in tone than their usual fare but just as serious. By adding comedy and Magic Realist elements to the film they create a sly subversive fairytale which is just as resonant now in this era of recession as it was in 1951. Toto (Francesco Golisano) is raised in the country firstly by an elderly lady who takes him in as a baby, then after she passes away he spends the rest of his childhood in an orphanage. Arriving in the city for the first time he is struck by the isolationist nature of the people there and becomes drawn towards the downtrodden finding them to be better company. Moving into a shanty town he inspires the residents to better themselves but when this eccentric self-reliant community proves too successful the authorities move in and try to claim the land. While the first part of Miracle in Milan belongs to the neorealist tradition the latter part of the film moves into the realm of the fantastical as statues come to life, policemen start singing opera, and heavenly messengers appear. While De Sica and Zavattini make fun of the rich the poor are also targets for satire. They willingly embrace consumerism when Toto gains the ability to make wishes come true and ask for all kinds of luxuries they don’t really need. They and Toto also delight in taking revenge against the man who refuses to conform with the group and eventually betrays them by selling them out to the rich. Toto is a cheerful idiot savant, an unwitting revolutionary who breaks societies rules because he sees no sense in them. The upbeat approach taken by De Sica and Zavattini mirror’s Toto’s optimism and is embodied in the jaunty score provided by Alessandro Cicognini which provides a carnival atmosphere. Yet Miracle in Milan is one of the bleakest films ever made, its magical finale suggesting there is only one way out of the poverty trap. The latest entry in the Arrow Academyrange Miracle in Milan gets the full Arrow treatment. Bluray and Standard Definition DVD’s accompanying booklet featuring writing on the film as well as John Maddison’s 1951 article ‘The Case for De Sica.’ There are short but enlightening interviews with De Sica’s son, and with actress Brunella Bovo. 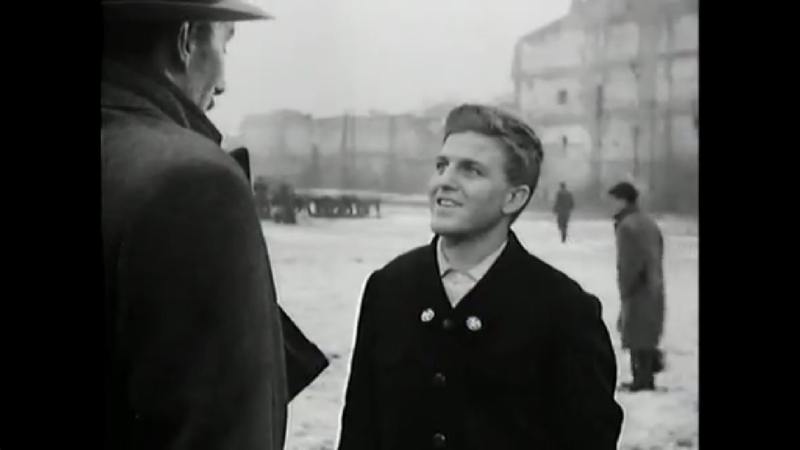 Newsreel footage of the film’s premiere gives you an idea of just how famous De Sica was in his native Italy and contains a brief interview with the dapper director and Zavattini. 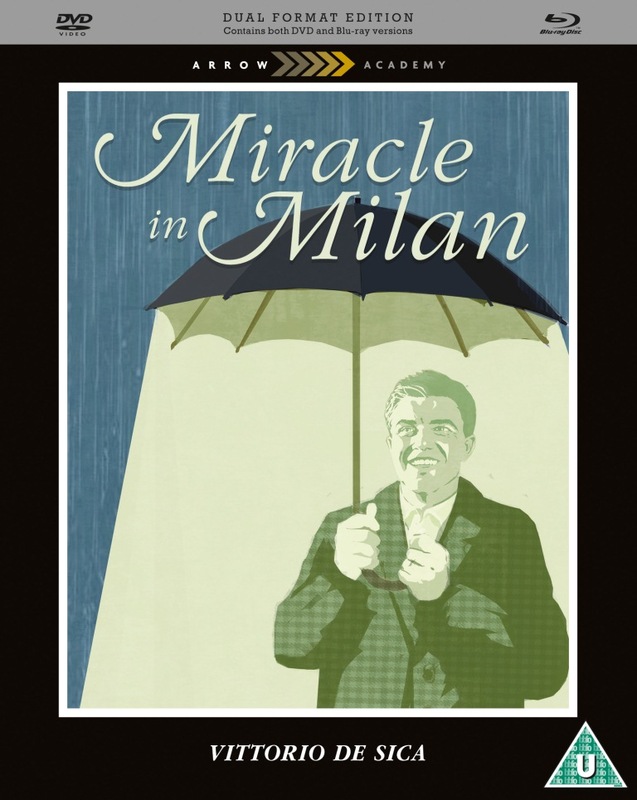 The film’s original trailer for Miracle in Milan is essentially a short film presented by lead actor Golisano outlining De Sica’s career up to that moment and then showcasing the film. 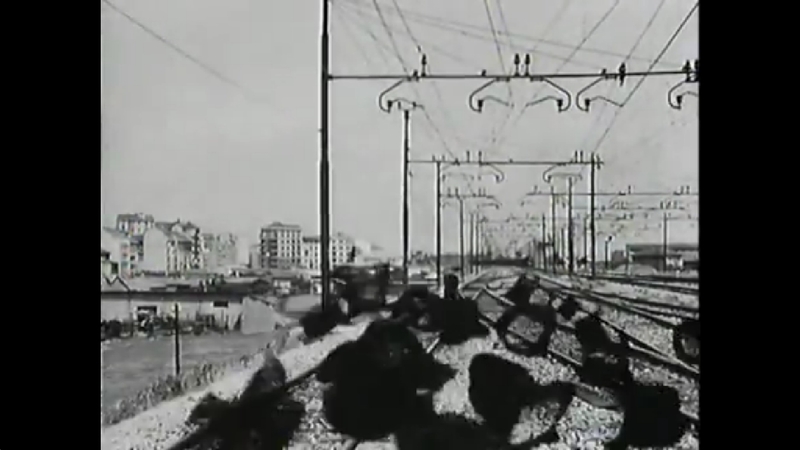 There is also a whole other film, Il Tetto (1956), previously unavailable on DVD. Again written by Zavattini it focuses on an impoverished newly married couple trying to find a place of their own during the redevelopment of Romeand is well worth a look.